Trace elements found in meteorites shed light on the inner workings of supernova explosions, which release stellar material into space that is recycled to form new planets and stars. Meteorites may hold new clues about the supernova explosions from which the stars and planets of our solar system formed. When a massive star reaches the end of its life, it implodes. This releases stellar material into space, creating a fiery explosion known as a supernova. In turn, that material gets recycled to form new stars and planets. Meteorites — the rocky shards of comets or asteroids that fall to Earth — are formed from the material left over from the birth of the solar system. Therefore, these tiny pieces of space rock preserve the original chemical signatures of the stellar material released during supernovas. Using meteorites, researchers from the National Astronomical Observatory of Japan suggested how to investigate the role in the supernova process of particles called electron antineutrinos, which are released during the explosion, according to a statement. Neutrinos are subatomic particles that have no electric charge and a mass so small it has never been detected. The antineutrino, an antimatter particle, is the counterpart of the neutrino. An electron antineutrino is a specific type of antineutrino. "There are six neutrino species. Previous studies have shown that neutrino isotopes are predominantly produced by the five neutrino species other than the electron antineutrino," Takehito Hayakawa, lead author of the study and a visiting professor at the National Astronomical Observatory of Japan, said in the statement. "By finding a neutrino-isotope synthesized predominantly by the electron antineutrino, we can estimate the temperatures of all six neutrino species, which are important for understanding the supernova explosion mechanism." To learn more about what happens during supernovas, the researchers suggested measuring the amount of Ru-98, an isotope of the element ruthenium, contained in meteorites. This, in turn, would help calculate how much of Ru-98's progenitor, Tc-98 — a short-lived isotope of the element technetium — was present in the material from which the early solar system formed, according to the statement. Neutrinos from dying stars interact with other particles in space to form technetium. The amount of Tc-98 is largely influenced by the temperature of the electron antineutrinos released in the supernova process, as well as the amount of time between the stellar explosion and the formation of the solar system, according to the statement. Therefore, studying the Tc-98 concentration in meteorites sheds light on neutrino-induced reactions that occur during supernova explosions, the study said. 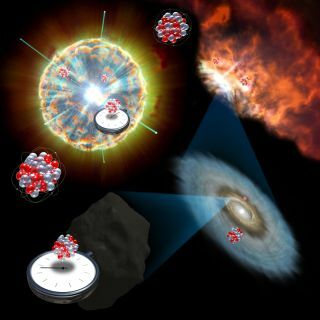 Published Sept. 4 in the journal Physical Review Letters, the study shows that the expected abundance of Tc-98 at the time that the solar system formed is not much lower than current detectable levels, suggesting that researchers may soon be able to precisely measure the substance and better estimate the time between the last supernova and the formation of the solar system.